Sony announced a new 13.6 megapixel Cyber-shot camera today. It will be interesting to see how this compact camera will handle noise issues with all those megapixels packed into a compact camera. 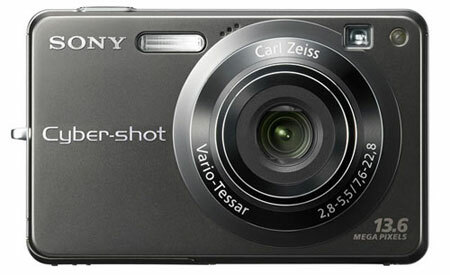 SAN DIEGO, Jan. 23, 2008 – Sony’s new Cyber-shot® DSC-W300 digital camera is expected to be among the industry’s most pocket-able, high-resolution point-and-shoot digital cameras featuring niche performance options. The camera announced today integrates an ultra-high 13.6-megapixel CCD imager along with a Carl Zeiss® Vario-Tessar 3x optical zoom lens, a 2.7-inch LCD screen and an eye-level viewfinder in a compact size. With its ultra-hard titanium coating, the model offers a premium look and finish that is highly-resistant to scratches and messy fingerprints. The W300 camera newly features an “extra high-speed” burst mode that can shoot three-megapixel photos at five frames per second, ideal for fast-action shooting of sports, pets or children. In addition to the blur-reducing effects of Super SteadyShot® optical image stabilization, the camera also has a new “extra high sensitivity” mode (up to ISO 6400 in this mode only) to help minimize blurry photos when shooting in challenging lighting conditions, such as indoors or at twilight, even without a flash. Noise reduction is now a user-selectable option, with high, low and standard settings, for greater control over the final look of images. For example, a low setting can help reduce noise without sacrificing resolution, making it ideal for landscapes and detailed subjects. As the top-of-the-line model in the series, the W300 camera integrates the latest “intelligent” features that help users take better pictures more easily. Sony’s Smile Shutter™ technology prioritizes the faces of children or adults so that the camera takes the photo at the moment the intended subject smiles. Improved face detection technology can also prioritize child or adult faces as the basis for the camera to apply focus, exposure, white balance and flash color controls for up to eight faces in the camera’s frame. The model’s intelligent scene recognition technology automatically can detect five different types of scenes and optimize the camera settings for those conditions for a better photo. And advanced mode can take two shots almost immediately – one with standard automatic settings and the other with optimized settings. The W300 model has a number of features to maximize picture quality. Among them are five color modes, including “real” for less in-camera processing and more faithful color reproduction; 12 scene selection modes with a new “underwater” mode that adjusts white balance for more natural-looking photos; Sony’s new D-Range Optimizer Plus that process picture to improve detail in photos with harsh highlights or dark shadows; and an improved auto focus system that includes macro ranges. Viewing and image management has also been enhanced with helpful date and calendar views, in-camera search by face or date, slide show with longer music files, and high-definition component output for viewing photos on a compatible HDTV set. The DSC-W300 camera and optional accessories will be available in May for about $350. All can be purchased online at sonystyle.com, at Sony Style® retail stores (www.sonystyle.com/retail), at military base exchanges and at authorized dealers nationwide.